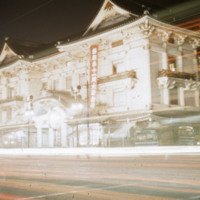 A night shot of the Kabukiza Theater, a large, classical revival building with strong Japanese influence. 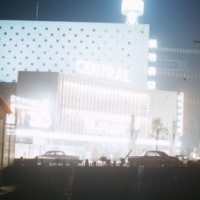 Streaks from automobile headlights are in the foreground. 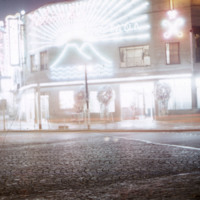 The Shochiku Chuo Gekijō (Shochiku Central Theater) is next to the Shochiku Kaikan, in Tsukiji, Tokyo. 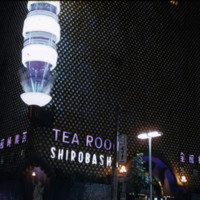 The building was built in 1956 by the Shochiku film studio. 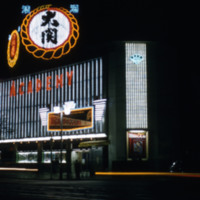 Bright neon lights dominate this night view of the Shochiku Academy Theatre in Tokyo's Ginza district. 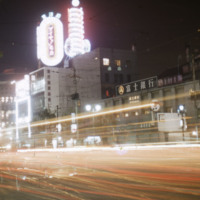 The Nichigeki was Japan's first large, luxury movie house of the movie palace era. It was built in 1933 and demolished in 1981. 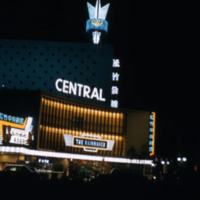 The Central Theater boasts a sign advertising "The Rainmaker". 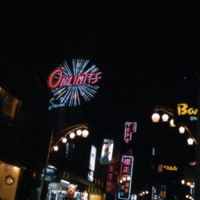 A neon sign reading "On limits" adorns a nightclub. 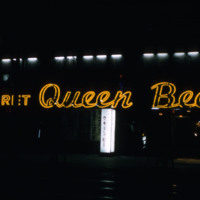 This Queen Bee Cabaret was located in Tokyo's Ginza district. 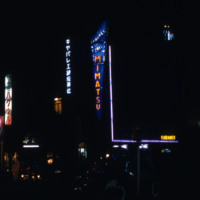 The Cabaret Mimatsu was located in Tokyo's Ginza district. The Shirobasha Tea Room where the Japanese tea ceremony called Chanoyu, Sado or Ocha was performed through a ritual of preparing and serving Japanese green tea, called matcha, together with traditional Japanese sweets to balance with the bitter taste of the tea. This is Pachinko Montana, a pachinko parlor. 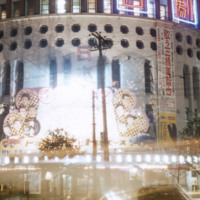 Pachinko parlors are usually for gambling which is played on pachinko machines and are comparable to casinos. 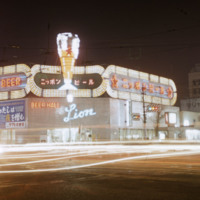 The Lion Beer Hall building, in the Ginza district of Tokyo, has been open since 1911 though they have since changed their name to Ginza Lion. Ginza Lion is still open today in the Ginza district. 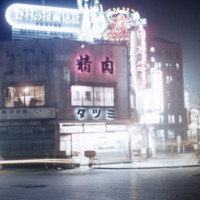 The Tatsumi Butcher Shop dominates the street corner with its brilliant lights in an urban area at night. 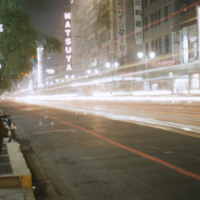 Due to the long-exposure style of this photo of the Matsuya Department Store in the Ginza district of Tokyo, the urban streetscape has streaking from automobile headlights. 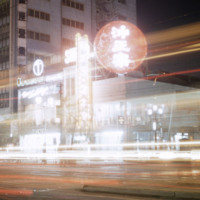 A long exposure shot of a branch of the Fuji Bank building in Tokyo's Ginza district at night shows the busy streaks of traffic along the road in front of the buildings. 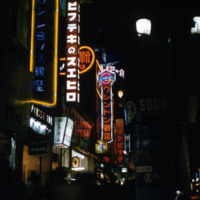 The Ginza district, "Silver Mint" district, of Tokyo is in the Chuo ward. It is considered the high fashion center of the city and contains many upscale shops and restaurants. 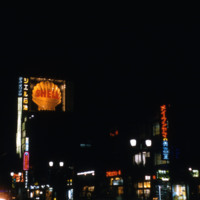 This depicts a night scene of brightly lit shops in the Ginza district. 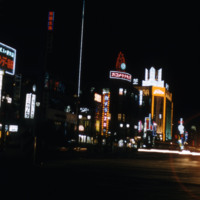 While the Ginza district is still a very active part of Tokyo, it has changed drastcially since these photos of it were taken. Tokyo's Ginza district at night dominated by impressively lit commercial buildings. 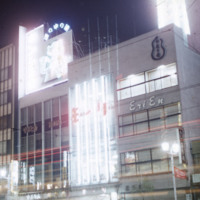 Ghostly long-exposure traffic lights blaze through this scene of the Ginza district at night. 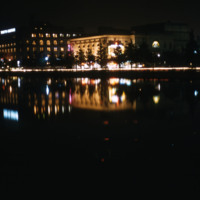 This is a night photograph of buildings reflected in the moat of the Imperial Palace in Tokyo. The Tokyo Imperial Palace is the primary residence of the Emperor of Japan and was built on the site of the old Edo Castle.